Wanna go to a gallery reception in Alexandria tomorrow? Kevin Mellema writes about shows, including the Reclaimed show at Target Gallery in Alexandria's Torpedo Factory. Nice plug for seminal DC area green artists Erwin Timmers and Adam Bradley in the article here. People who work with Campello say her desire to take on challenging roles is evidence of another essential quality among successful actors. It’s why she landed a recent role with the Seattle’s 5th Avenue Theatre’s Touring company, and why she has upcoming roles with theaters in Issaquah and Olympia. Read a profile on my daughter Elise Campello by Paige Richmond here. I'd like to see her audition for some roles in Washington, DC soon. We all, not just athletes or baseball fans, owe a tremendous debt to Jackie Robinson. Not only because of Major League baseball integration, but more importantly, because of the significant advancement of race relations worldwide that was the real aftermath of his actions during and after his baseball career. His sacrifices must never be forgotten or diminished, and Robinson was and will always be a hero, not just for Americans, but for mankind. That is twelve years before Jackie "arrived"
You need to remember this "fella"
"When you're working in clay," says Laurel Lukaszewski, "you'd have a tough time if you worry about breakage." Read the WaPo profile on DC artist Laurel Lukaszewski here. "I often wonder how other galleries are dealing with artists who have gallery representation but continue to self-promote. I have been known to secret shop gallery represented artists. I contact them through their emails on their personal websites and inquire as to whether they have any studio pieces available. Not once has an artist directed me to his or her galleries for purchases. The above from comments by gallery owner Carrie Horejs. Read them here. Yesterday's Washington Post's Weekend section had the kind of arts coverage that a city can only dream of... it covered the coming Crafts Week DC extravaganza that I mentioned last week. 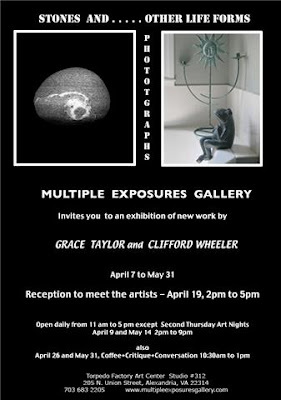 Opening Reception, Sunday, April 19th, 6-8 PM at Photoworks Gallery, in gorgeous Glen Echo Park, MD. Work by Rob Grant, Gary Jimerfield, and Scott Grant. Through May 17, 2009.